Anyway...this week we decided to do a Paul Deen recipe. I love that white haired lady. She is my hero. But this recipe is SO not my hero. I was watching her the other morning and she made these PB & J muffins, and I thought they'd be interesting. I wasn't impressed with it. I mean, it wasn't disgusting or anything, but I was expecting a lot more flavor. They were super easy to put together. I couldn't wait to bite into one. And taste that raspberry jelly hidden in the center. The cake was moist, but I thought there would be a lot more peanut butter taste. O'well...live and learn. The compound butter is what was the best part. I slathered the heck out of my muffin with the stuff and then it was DELISH! Go here to get the recipe if you want to try it. Who knows? You might really enjoy it. Well you're in luck sister. I did have good luck with mine. Only, I didn't realize I wasn't doing a Paula Deen recipe until it was too late. I'm close! This recipe is by Paula's son Bobby Deen. He grew in her womb. Ha ha. I'm counting it! Anyway, I was browsing the Paula Deen section on The Food Network website looking for a recipe that caught my eye. Once I saw the words "rice pudding" I didn't get any further. Oh blah, you say? Maybe. But I don't say blah to any kind of pudding, especially the rich delicious puddings, I say Mmmmmmmmm. The kind of Mmmmmmm that makes my heart sing. You know the moment on Ratatouille when Anton Ego the critic takes a bite of the Ratatouille and is taken back to his childhood? That kind of Mmmmmmm. That's how I feel about most puddings. They make me happy. Whoa! Sorry, I went nuts there. Anyway, this recipe didn't look insane so I thought I would give it a go. 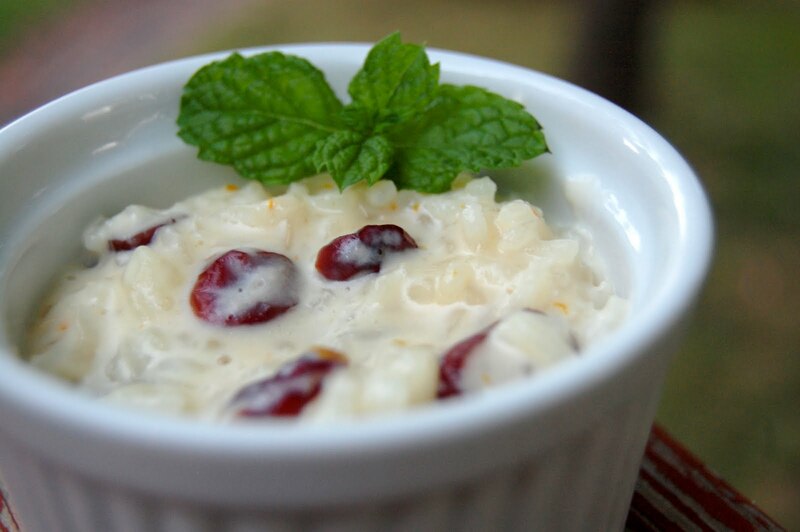 Even in the dead heat of summer, I love me some rice pudding. This was fun to make too. The recipe calls for use of a double broiler. I don't have one, but I have learned a little trick in all my baking endeavors. I use a metal bowl over a simmering pot of water. It worked beautifully. I put the milk, water, salt, and rice in the bowl, covered with tinfoil and let it cook. I was a little unsure if it was going to work but it did. Once the rice was cooked I added cream, sweetened condensed milk, and craisins. I let that cook and thicken over my modified double broiler for 30 minutes and added orange zest and vanilla. So did I have that Anton Ego moment? It was close, it was close. I think with a tweak here an there, this could be my perfect homemade rice pudding. Yum. You can find the recipe here. Enjoy!